STILLWATER – As Isaac Likekele picked the pass from the air, his eyes drifted down the court looking for someone to throw an outlet pass to. A streaking Cameron McGriff was unguarded going up the left side of the floor, and Likekele fired a pass into his hands. McGriff continued to the rim, where South Carolina’s Felipe Haase was waiting. McGriff rose, cocked the ball back in his right hand and slammed home a ferocious dunk over Haase while getting fouled. 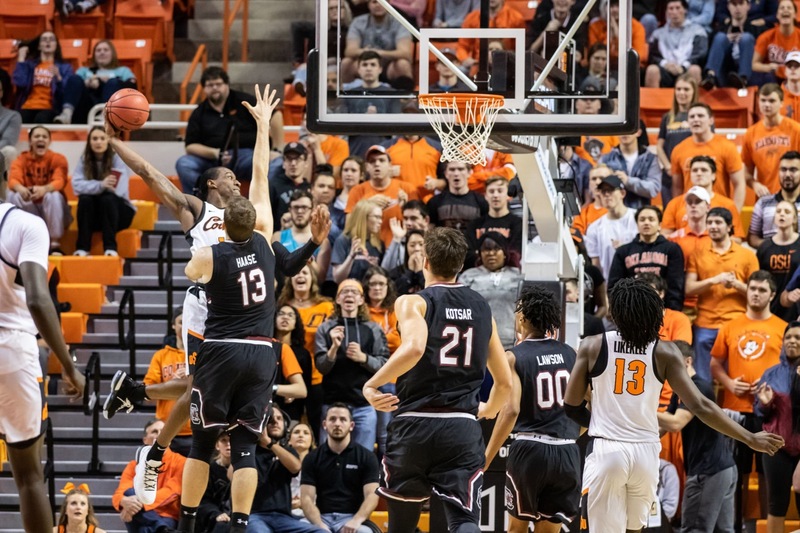 The slam was in the middle of a second-half run which helped propel the Oklahoma State men’s basketball team to a 74-70 victory against South Carolina on Saturday in Gallagher-Iba Arena. An 8-0 run in the second half helped spark a once paltry crowd of 7,658 fans to become boisterous for the remainder of the frame, as the Cowboys ended a three-game skid. McGriff, a junior, tallied 14 points, though his fellow captains outscored him. Dziagwa tied a career high with 19 points on five makes from deep, which also tied a career-best total. Lindy Waters added 17 points and six rebounds. The Gamecocks captured a 40-39 advantage with 15:14 left in the second half after coming out of halftime quickly and disruptive on defense before OSU’s run. Chris Silva, the Gamecocks’ star player, made a putback basket to give them a 63-62 advantage, but McGriff’s third dunk of the night, off an alley-oop from Isaac Likekele, gave OSU (9-11 overall) a lead it wouldn’t relinquish. Yor Anei is hard to miss with his 6-foot-11 frame. South Carolina (10-9) found that out on Saturday. Anei was a force, going for a team-high +18. Boynton said the plus/minus stat doesn’t always tell the whole story, but it was indicative of how well his freshman center played. In 35 minutes, Anei posted a team-high 11 rebounds, including four on the offensive side. He was constantly diving on the floor for loose balls and barreling into the stands to save others. On one play in the first half, Anei scrambled to the left corner and flung a ball to Dziagwa on the wing before it went out of bounds. Dziagwa found Waters up top, and after driving found Curtis Jones with 20 feet of space in the corner for his lone 3. His defensive prowess was also impressive, as he tallied three blocks and disrupted passing lanes. Boynton, along with Waters and Dziagwa, praised his growth since earlier in the season. OSU lost a player on its roster for the third consecutive week. Trey Reeves, who was put on scholarship at the beginning of the season, broke his right foot in practice and will miss the remainder of the year. His injury leaves OSU with three healthy forwards: McGriff, Anei and Duncan Demuth. The son of Bryant “Big Country” Reeves hasn’t appeared in a game since November and played in only four this season. The remaining Cowboy roster has nine healthy players on it. Boynton said Friday a couple walk-ons from the tryouts last week would be added to the active roster in the coming weeks. Boynton said he was caught off guard when he heard the news of Reeves’ injury. “It’s been a hell of a week, man,” Boynton said. “I slept about 45 minutes last night. My throat was killing me. I couldn’t swallow. I didn’t even know Trey was hurt. We were ending practice on Thursday and I was huddling the guys up. I knew Trey hadn’t been there. I thought maybe he went to use the bathroom, and I look over in the corner and he’s standing there with a boot on.